tents with too many people, it suits perfectly a 2-person tent and two of them will get you really comfortable in a 4-person tent. As it’s a battery powered fan for camping, it saves a lot of energy lasting up to 21 hours in full-speed with one set of batteries. Also, it’s convenient for using with kids, as the blades are foam-made. Finally, it stands by itself and folds for a very comfortable storage, so it’s really convenient for short quick trips. Tilting head allows directing the air and also folding easily for storing. The blades are soft to the touch and won’t hurt even in high speed. Includes low and high speed for comfort. It’s fairly quiet for an outdoors camping fan. Includes screw set for mounting on the wall if or shelf if needed. It uses 4 D-cell batteries that sold separately and may be expensive. Also, it doesn’t work with rechargeable batteries. heat. It vibrates if not put in a well-balanced surface, which might be a problem in the wild. best camp fans in the portable series. Even though it’s not foldable, due to its design, it’s very small and the squared shape makes it ideal for storing in any backpack. While its blades are not foam as the Coleman model, thanks to its protective cover, it’s still very safe to handle around kids, while bringing a considerably more potent breeze. It would be enough to acclimatize a 4-person tent when the temperature is not TOO high. It’s a battery powered fan for camping but it also can be connected to AC for using indoors. While it works with 6 D-cells batteries, its power-saving technology makes them last for even days to full speed while maximizing the airflow. 2 air speeds, high and low. The materials are really strong so it will endure several travels. Easy cleaning with a dry cloth. The 6 D-cell batteries may be very expensive. The battery compartment cap is weak. 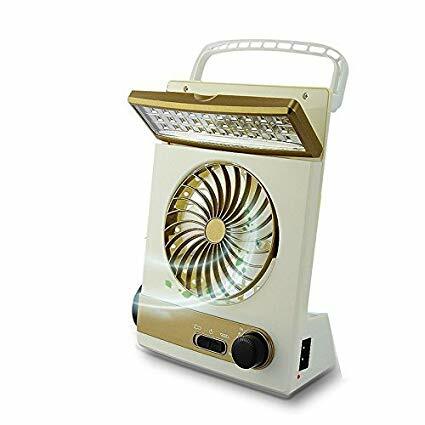 recommendable as a lantern, since it lasts 30 hours when only the light is working, but that time reduces to 6 hours for only fan and only 3 hours for both light and fan. 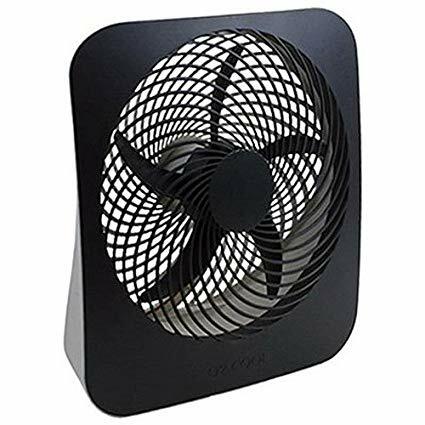 USB power connection, so if you have access to this kind of power, then it’s a great fan with a much better airflow than the previously reviewed models. Uses 3pcs AA batteries (rechargeable or not) and can be used with USB power (cable included) and no batteries or used for charging the AA rechargeable. 360° angle for directing the light and fan, and can also be hanged. Simple to use, with one button you can change from off/fan on/lights on/fan and light on. The battery runs out very quickly when using the fan. Fan and light can only be used simultaneously with LOW lights. • You need to use the USB power to recharge the batteries before they get below 10%. time a very safe and powerful hanging tent fan. 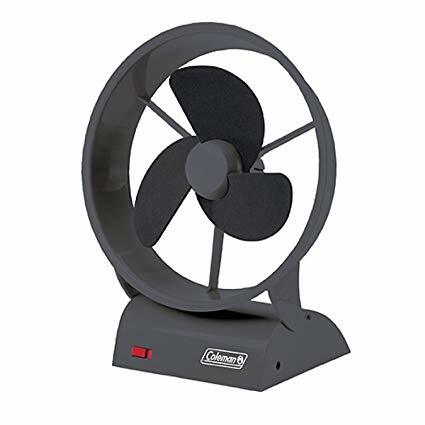 While not ideal for a tent bigger than 2-3-person, this fan offers a considerably longer range of duration than the previous model. 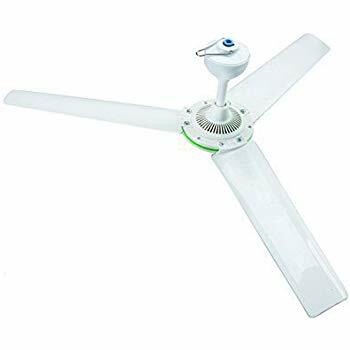 The light and the fan are controlled separately, avoiding the dimming light when used simultaneously and offering the possibility of changing the fan speed from low to high. One of the best features is that it can be used with a set of 2 D-batteries or simply 1 D-battery (while obviously lasting shorter) so you won’t have to spend too much on batteries if going for a shot hike ride. 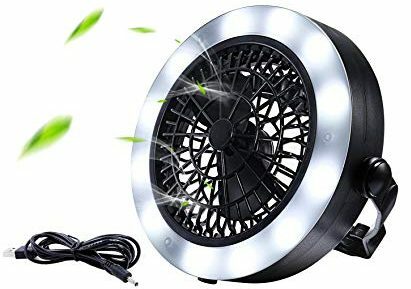 Very bright light even when used simultaneously with the fan. Two fan speeds are powerful enough for 3-person tent. 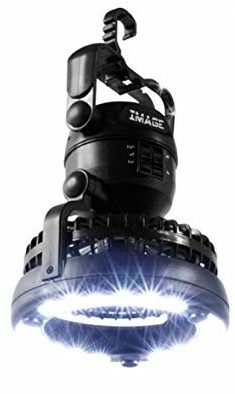 360° adjustable head for directing light and air. 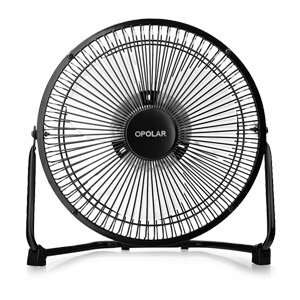 It can be adapted to use both hanging and as a freestanding fan. It offers some white noise while not TOO loud. You might need more than one if you own a 4-6-person tent. It’s a little bit heavy with the batteries on. The plastic covers are a bit weak. thanks to its industrial grade metal structure. Also, it works with rechargeable batteries and can be adapted to USB power and even wall adapters. Two very powerful low and high speeds. 360° adjustable head for directing the airflow. Can work with one battery for 3-6 hours and with 2 batteries for 6-9 hours. Very quiet while still producing a light white noise. Very quick charging time with a red-turn-blue notification light. You can’t charge the batteries while using it. Blades are plastic, not metal. The batteries could last longer. can also be connected to a solar panel which is what we’re looking for in this section. plastic very safe and durable. Can work with a 12V battery and connected to a solar panel, this way can run permanently. Moves fair amount of air while not being noisy. Very easy to install with safety anti-shock cables and a controller. Is very lightweight so it can be installed even in tents. (Make sure the tent is high enough, 6-person tent at least). Not powerful enough for too much heat. Solar panels are not included, must be purchased separately. there is good, you can connect it to a solar panel and make it run endlessly; if it’s cloudy you can still use it with its 12V battery and if you’re camping on an RV and have an available USB connection, you can charge it that way too. Very energy saving lasts longer with the battery use and runs non-stop with solar panels. Really lightweight can be installed in any kind of tent as long as it’s high enough (6-person tent will do). 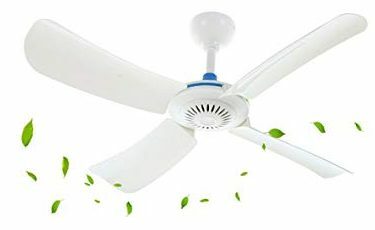 ABS plastic fans are flexible and durable. Doesn’t include the battery and charger, must be purchased separately. lover can make. 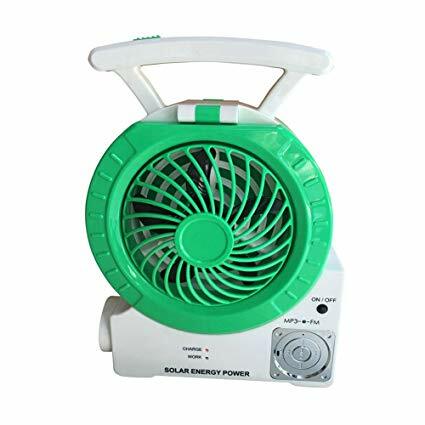 Really small and portable, this is one of the best tent fans as it not only includes the cooling system but also a lantern flashlight and works as a power bank for charging other electrical devices. Charge it with its included solar panel on top or connect it to an electric output. It’s collapsible to make it even easier to store. The Acelane 4 in 1 is a complete camping kit in one small product. Several uses for camping purpose and will last up to 15 hours of continuous use with the solar charge. Convenient handle for carrying while walking. While the fan is really small, it’s powerful enough for repelling mosquitoes. You can use it as a power bank/solar panel for other Tent fans or flashlights. The military ABS is not as durable as expected. stands for freestanding purposes. Even though it is solar powered, it can also be charged with 110AC connection and holds up energy for use during the night and without a connection. Light and fan have an adjustable position system for directing the air and light to where it’s needed. Really powerful fan for its size and torch is amazingly strong while lantern is bright enough to not be dazzling. Lasts up 6 hours with light and fan at a time, 8hrs with only one. Easy to charge and carry due to its small size. The materials could be better. The battery could last longer. devices and listening to music! 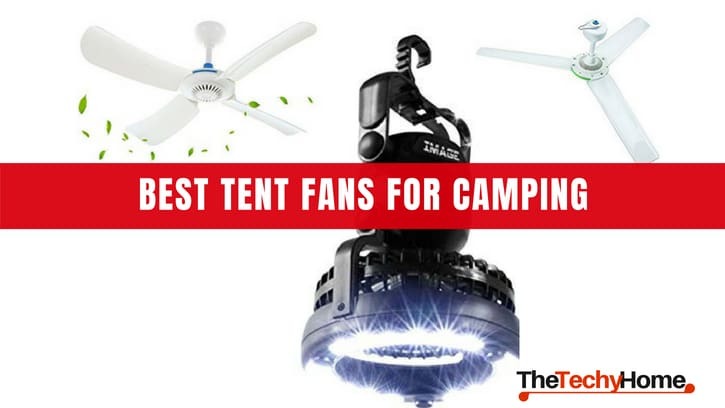 This is one of the best camp fans also because with its solar panel, it can be constantly recharged and lasts a fair period with every feature; 7 hrs fan, 9hrs light, 6-8 hrs music and charges at least a whole battery of an external digital device. it definitely will fight hot weather if used in a 4-person tent and will repel mosquitoes when needed. Earphone jack for listening to music. Music can come from integrated FM radio or connect USB devices or SD cards! The fan is fairly powerful for its size. Charger for audio devices and cellphones/tablets. If all the features are used at a time battery will die very soon. It needs 13 hours exposed to sunlight to fully charge.